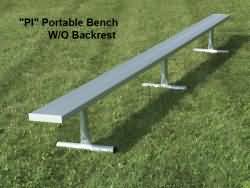 The BE-PI portable aluminum bench without back is a great choice for an outdoor soccer or football players bench. They also make great baseball dugout benches. 6' L Portable Bench No Back (outdoor)- Seats 4 Weight 63 lbs. 8' L Portable Bench No Back (outdoor)- Seats 5 Weight 66 lbs. 12' L Portable Bench No Back (outdoor)- Seats 8 Weight 87 lbs. 15' L Portable Bench No Back (outdoor)- Seats 10 Weight 92 lbs. 21' L Portable Bench No Back (outdoor)- Seats 14 Weight 141 lbs. 24' L Portable Bench No Back (outdoor)- Seats 16 Weight 159 lbs. 4' L Portable Bench No Back (outdoor)- Seats 2 Weight 33 lbs.